I’m hoping to be back to regular posting in a short time. 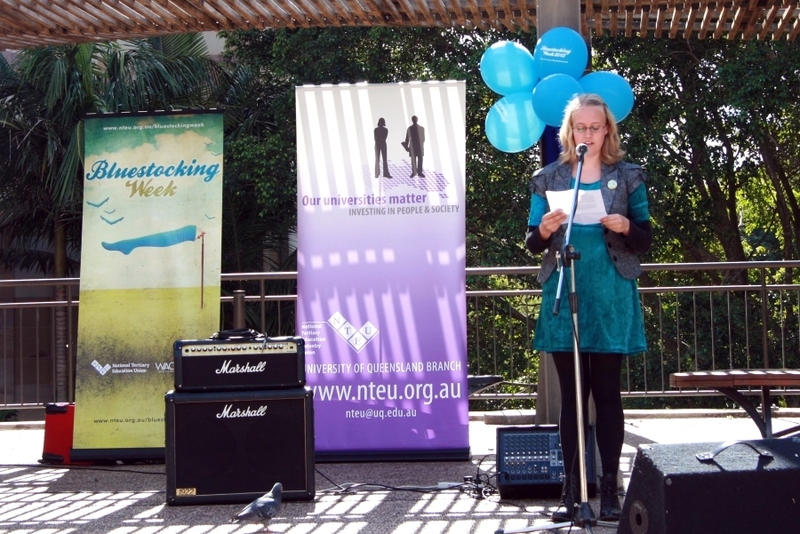 Until then, here’s a speech I wrote for Bluestocking Week at the University of Queensland. Enjoy! University has been my dream ever since I decided, as a twelve year old, that there must be something more to education than year seven. Bored out of my mind, I longed for the day when I too could start my romanticised journey into academia. Now, I’m in my second year here at UQ, studying Ancient History and Archaeology and loving every minute of it – well, except for the late nights before final essays are due. It’s even better and more exhilarating and more challenging than I expected it to be, and I plan to continue on to honours and a PhD when I finish my BA, and eventually become an academic myself. But now that I’m here, I’m also starting to see some of the problems that are faced by so-called career women like me, and it shows just how much society still configures leadership, academic and management positions as male realms. When I look a little deeper into the university system, the glass ceilings for women start to become evident. Just the other day I found that there have been several recent studies done in my chosen field of archaeology on just this issue. One study, by Smith and Burke in 2006, showed that there are systemic barriers to women’s success in academic archaeological careers in Australian universities. Overall, there are over double the amount of men with permanent academic positions than women, showing that it is much harder for women to gain entry level positions. However, the study also showed that once in the university system, women are overrepresented in lower-paid teaching and research positions, and severely underrepresented in higher positions. Using lecturer positions as an example: at the time of the study, women dominated lower-ranked level A positions, while after that in levels B, C, D and E, there are three times as many men as women employed. Similar trends emerged when Smith and Burke looked at publications in four of Australia’s major archaeological journals, and found that women had been published significantly less than men every year in the past decade. Another more recent study, by Bowman and Ulm in 2009, showed that women are substantially less successful in being awarded ARC grants overall than men, and that a pattern emerged where even successful grant applications headed by women were awarded less money on average than those headed by men. Furthermore, when they looked to the ARC panel members who decide who gets funding and who doesn’t, they found that when there were more men on the panel, less grants were awarded to female academics. The same, however, wasn’t true in reverse. These sorts of trends worry me, because as a female undergraduate aspiring to become an academic, they apply directly to my future. I’ve always assumed that whatever career I end up in, I’ll be given positions according to my strengths and experience and knowledge, not passed over because of my gender. I’ve always assumed that when I’m applying for a research grant one day, I’ll have just as good a chance as the equally-qualified male applicant I’m competing with. What’s most disturbing is that these trends can be seen almost everywhere in the workforce. On the whole, women are overrepresented in lower-paid positions and vastly underrepresented in higher-paid positions, on boards, in management, in politics. It seems that working women are still facing the same struggles: not being taken seriously, and failing to achieve equal representation in highly skilled and paid jobs. So where does all this come from? I’d argue that the difficulties faced by women in the workforce are still based on very outdated ideas about what women can, can’t and should do. For instance, it’s still expected of most able-bodied, heterosexual women that they will eventually have children, and women who don’t share this plan are chastised as unwomanly and cold. But when you look at the disadvantages that mothers face in the workforce, such as increased and long-term financial instability and difficulty getting back into the workforce after taking time off, it’s no wonder that these trends of underrepresentation are so strong. For some reason, the idea that one day I’ll have to choose between advancing my career and having the children everyone expects of me is still very real. And although parenting is slowly including more men, women still shoulder the majority of childcare responsibilities, as well as the majority of unpaid domestic work. Women are still seen as not capable of making hard decisions without their emotions getting in the way, and other gender-essentialist drivel proliferates. And it’s really not helping when the media starts waving a copy of fifty shades of grey in our faces and reminding us that really, all women just want to be dominated by a man, is not helping at all. All these factors contribute to gender inequality. So where to from here? Affirmative action policies are a start, but what really needs to change is our underlying perception of what women are, what they want and what they can do. And that’s why gender equality sadly isn’t going to be achieved overnight, because changing the mindset of a whole society is a slow and unforgiving process. But little by little, through events such as these, and campaigns, and policies, we can begin to change the system. And hopefully, by the time I enter academia myself, I’ll be valued on the basis of my qualifications and experience, and not judged on terms of my gender. Hey, great post. I’m really happy to see academic women speaking up about challenges that face women in academia. I know as an engineering student I am leaning towards leaving the academic community because the challenges women face are so great. Thanks! Yeah, engineering must be tough as a woman. I was so surprised that the archaeology field still had such a significant gender gap and glass ceiling! You don’t really expect it until you see it first hand, universities are meant to be so progressive in terms of fair work and all.